Warrandyte’s annual festival kicked off last month with popular evening events, Warrandyte Film Feast and Warrandyte Donvale Rotary Art Show. 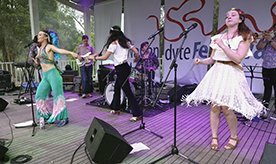 The festival celebrated the town’s hallmark qualities over the weekend of March 22–24 via the theme “Stars of Warrandyte”. A star-studded cast came out with props and colourful costumes. Variety Bash “Benzey” — now there’s a star! Sixteen Variety Bashes throughout Australia, raising money for children’s charity. Giant ducks, mountain bikes, Dylan’s trike (made at school from recycled materials), CFA pumpers, scouts getting about — and all this to the shout of Town Crier Ian Craig. Rain made a half-hearted attempt to dampen enthusiasm but never really had a chance. You see, for locals, nothing speaks to community pride more than Warrandyte Festival. This year, the town clocked up 43 straight festival runs, thanks to a committed band of volunteers who continue to come up with ideas and the gusto to see them through. A week earlier, organisers were told by Manningham Council that due to safe food-handling regulations, the Kid’s Market would not be able to sell baked goods — staples for these stalls, really, but rules are rules. Families were notified and organisers feared the worst: dozens of disappointed children and parents, doing their buns and pulling out. But, that is not the Warrandyte way. A prize-winning number of stalls were registered — 70, in fact. Kids’ Market organiser Grace Johnstone told the Diary that many interesting ideas were presented on the day, but it was “Warrandyte’s spirit of cooperation that was truly on show”. Taking the cake, for mine, was a repurposed duck-race duck —complete with potted plant — “Hugh Quackman”. 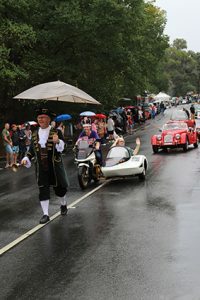 Sunday’s Billycart Derby action drew a few choice words from parade monarch and motorcycle racing champ Cameron Donald, who helped out on the mike. Cam’s commentary skills were tested — a minor stack, a false start and several finishes that looked too close to call — but he came through unscathed. Phew! Meanwhile, on the Main Stage, the smooth countrified vocals of local performer Jo Pearson and the Pearl River Ramblers set up a further flow of excellence from Sydney’s alternative Country combo The April Family, dirtgirl and Mother Earth. Fabulous Tom Petty/Fleetwood Mac and feisty Janis Joplin tributes followed on. A day earlier, Riverbank Stage audiences had kept pace with drumming sensation African Star, before local bands Velvet Lounge and Riffmasters chilled things down to create a relaxed vibe. In a new move, festival organisers brought Friday night’s three-hour Battle of the Bands (BOB) to the Main Stage on Saturday. Applause for first-time festival volunteer Opal Gough. It was a huge hit, giving young acts the opportunity to play primetime on a stage that has seen local bands like The Teskey Brothers and The Scrims go on to achieve success further afield. Among others, bass player for The Teskeys, Brendon Love, stepped up as a Battle judge, offering the young players valuable feedback and advice. Also helpful was Ben Dennis, (ex BOB organiser and manager of award-winning Australian electronic music duo Peking Duk) who generously produced 12 tickets to an upcoming Peking Duk concert as an event prize. Ethical Decimal, a four-piece all-girl band from Castlemaine Secondary College, won the competition overall. Gozleme, crepes, salted caramel ice cream, those little pancakes that everyone loves, a giant spring roll — I couldn’t decide among some fab food choices this year, so tried them all — in one afternoon. A good thing St John’s Mobile CPR Learning Lab was on standby. Later, lighting genius Hugh McSpedden boosted the night sky and transformed trees around the Main Stage with creative images. But, stars eventually fade from view. If you lost your mind over Hugh’s light show, the Information Caravan has it and some other things as well! Watches, hats, mats and multiple pieces of Tupperware with the name Carla Thompson on them: contact Carolyn on 0411 789 922 with lost property enquiries. WHILE THE day started with the weather raining on our parade it ended with a twilight battle of the bands in Stiggants Reserve in what could only be described as a very pleasant and balmy evening. Sitting in my favourite camping chair enjoying a pint of Kellybrook Ale, this sure was a good idea to hijack my wife Jo’s Warrandyte Diary assignment. “You just keep working on your other writing assignments I will do this one for you,” says I, ha-ha, all part of my cunning plan. With Greg Champion MC’ing the night and surrounded by three to four hundred fellow festivillians it was a pleasant night indeed. As Greg Champion said to me when I asked him about the night, “The Battle of the Bands has brought more people in then our band … be young or die”. Don’t take it personally Greg. The competition started in the 80s with the back of a tray truck for the stage in the middle of the footy oval. After a number of moves it has finally made it to the main stage and judging by the crowd it is there to stay. The idea behind Battle of the Bands is that young aspiring musicians get a chance to demonstrate their creative “musicality” (I don’t know what that means but the judges told me that’s one of things they were looking for) in front of a good audience and the judges score them on the things that musically talented people look for in an up and coming band. The judges are no slouches in this field with Fiona Steel (half of the indie folk duo GraceJean and session artist), Brendan Love (from Warrandyte’s own The Teskey Brothers), Joseph Dwyer (Moring After Girls), Fossa (Melbourne based Hip Hop Producer) and Kain Hardie (musician and music journalist). Fiona told me she was, “looking for overall musicality, interaction with each other, interaction with crowd”. I asked if it brought back memories for her. Of course the audience got in on the act with the people’s award voted through the event page on Facebook. Nice touch although there was a lot of voting happening before some of the acts even hit the stage, go friends. Acts included Reborn Rebellion, Dead Pig, C-K-H, In The Works, Bleached and Blessed, Ethical Decimal, Suzi and Space Goats. The winner of first prize (a full day of recording at Jet Studios) was Ethical Decimal, a young all female band from Castlemaine Secondary College. Runners up were a young solo act, Suzi Yaghmoor from Mornington Peninsula and Dead Pig from Park Orchards. First timer organiser Opal Gough, joined the Warrandyte Festival Committee in November last year. Well done to Opal, her assistants and the committee for a great night, we thoroughly enjoyed the entertainment and the beautiful evening. 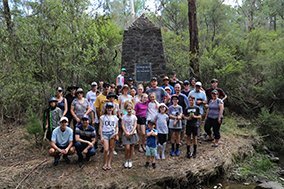 THE WEATHER was glorious for the Hanson’s annual Sunday afternoon Gold Mine Tour and a group of around 50 people made their way up to the top of Webb Street for this Festival highlight. Entry to the tour is free, with a small donation requested to raise money for Oxfam’s Walk Against Want, which raises money to assist women in developing countries who have to walk tens of kilometres each day to fetch fresh water. The tours have been running since 1978 and up until recently were run by John Hanson himself. But 42 years is a long time to run Gold Mine tours and these days, John has passed the baton on to his children; Peter, Jenny and Christine. But before we headed off on our tour with Jenny and Christine, John gave the group potted history of gold mining in Warrandyte and the popularity of the tour. 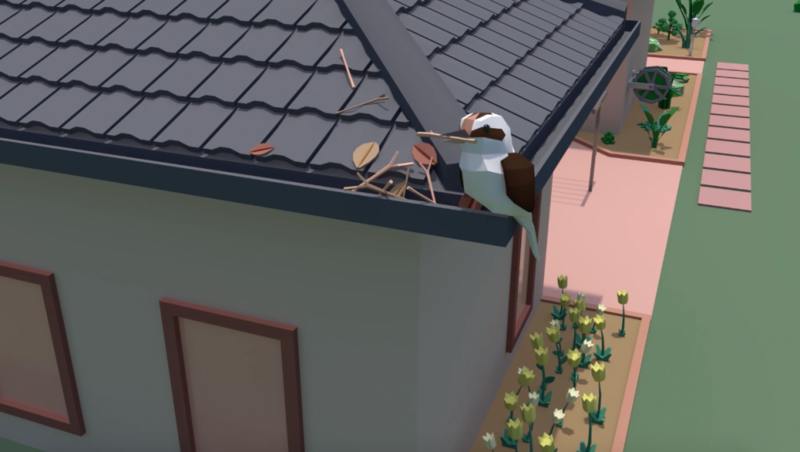 “Typical gold country has three different types of eucalypt, red box, long leaf box and red stringy bark and often if they saw those sorts of trees [the miners] would think there is gold in the area,” he said. “In some years, I had 200 people turn up, I borrowed a loud-hailer and off we went, but with 200 people, it was pretty slow. “One year I decided to split it into two groups, 1pm and 3pm — 1pm 35 turned up, 3pm 150 turned up so I went back to just one time,” he said. A short, bushy walk through the Hanson’s property and we reconvene at the top of Tunnel Street where Jenny begins the official tour. Jenny explains there are two types of gold found in Warrandyte, alluvial gold and gold found in quartz seams. Alluvial gold was panned in the creeks and the Yarra and our tour would involve a walk down the hill to Andersons Creek to visit the cairn where gold was first found in Warrandyte. But before that, Jenny took us to Forth Hill Gold Mine where the group could get a feel for what it was like to be in one of these mines, even if nowadays, people can only walk 10 metres inside the old mine. Jenny’s knowledge of the mine is impressive and it is enthralling to watch her map out the layout of the mine in the dirt. A lot of this knowledge extends from previous decades, before the mine was closed to the public when she was able to explore the network of mines around Warrandyte. With public safety paramount, access to the mines is prohibited and we have to use our imagination as Jenny imparts history and personal experience. The second, and last, stop on our tour is to the Gold Memorial cairn, on Gold Memorial Road. “This is the spot where they first found gold in Victoria, in 1851”. An exciting statement and given the regions history with gold mining, really helps place Warrandyte in Australian history. “Louis Michel came here with a party of four who were panning in this creek and found a few specks of gold…that then started the gold rush in Warrandyte. 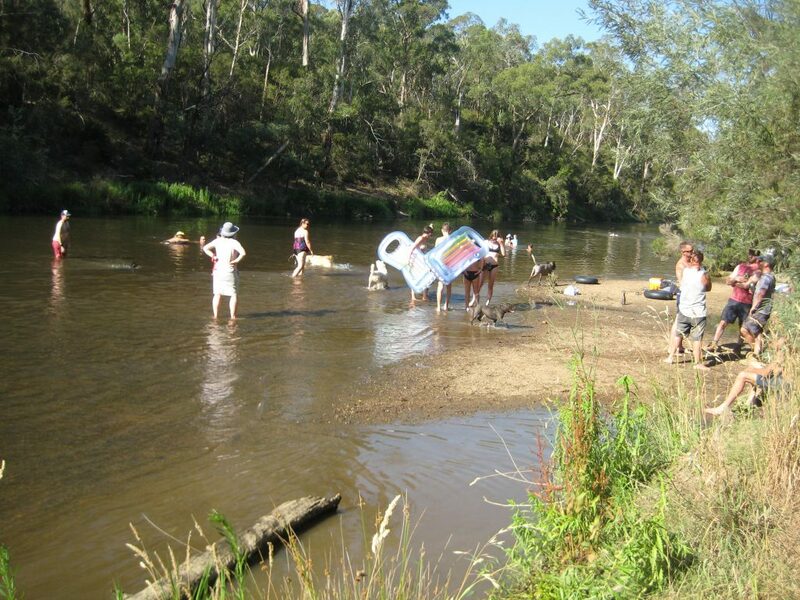 “They had sections of the creek, it was tent city for about five kilometres, between here and what is now Ringwood. To add an extra pinch of excitement to the tour, descendants of Louis Michel, his great-great-great-grand-daughter and her children were on the tour. Living in Eltham, it is fascinating to see that Warrandyte’s gold history still maintains a local connection. With the tour torch successfully handed to his children, it looks like the Gold Mine Tour will be around for the next 42 years, we only scratched the surface of Warrandyte’s mining history but with the knowledgeable Hanson’s at the helm, I look forward to learning more about the history of Warrandyte’s gold mines in years to come. THE PET SHOW is a long standing fixture of the Warrandyte Festival. I can’t recall exactly when it started, but I suspect I have MC’d this event for more than 30 years. And a wonderful and heart warming number of decades it has been. This year, we again had sponsorship from the Warrandyte Veterinary Clinic who provided some wonderful hampers for the prestigious Best in Show Award. This year’s big winner being a gorgeous spoodle puppy named Monty. The usual categori es such as Dog Most Like its Owner (loved the couple of Wonder Women.) and Shaggiest and Waggiest dogs were lots of fun. The Loudest Dog in Warrandyte was ear piercing and won by a most vocal fox terrier. This little rascal’s name is suppressed in case the Dog Ranger gets any ideas. Well, not really, but it was certainly a noisy little dog. Of course, Best Trained Dog always excites our imagination, Big Boy Bosley seems to have a new trick each year, and was happy to play dead when his Mum shot him (with her index finger, of course). Molly, another spoodle, was most attentive as her trainer placed a treat on both front paws, and waited for the command to eat. I thought I might try this with my black lab, but it’s never going to happen. 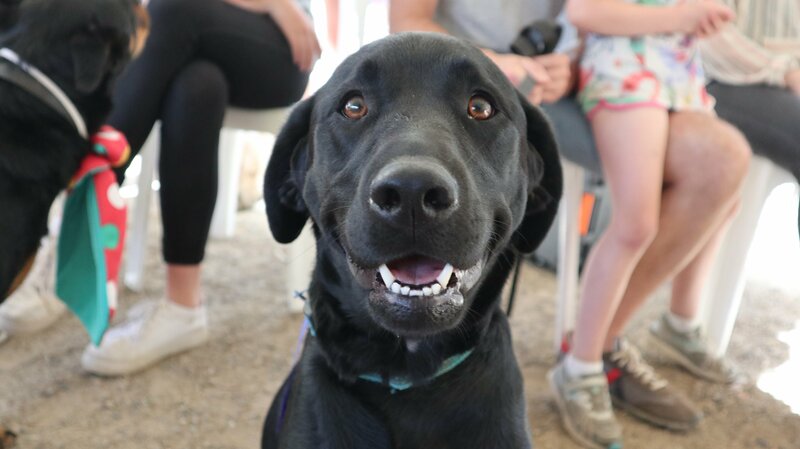 Overall, lots of bragging rights as most dogs (and the ferrets) managed to excel at something, including Dog with the Most Appealing Eyes or Best Groomed Dog in Warrandyte. A big thanks to Judges, WHS Principal Dr Stephen Parkin and Warrandyte Vet nurse, Kimberley and their assistants Mrs Suzanne Martin and Bree. THE VICTORIAN Electoral Commission (VEC) is conducting an Electoral Representation Review of Nillumbik Shire Council. In this review, the VEC will look at Council elements such as the number of councillors, the number of wards, where the wards are located and how many councillors represent each ward. The VEC conduct this review of every Council in the state every 12 years. Submissions for the Preliminary Report are being accepted until 5pm, Wednesday, March 13 and can be submitted to the VEC in writing or through their website. VEC Electoral Commissioner, Warwick Gately AM is encouraging all Nillumbik Shire residents to get involved, as this review will determine how residents are represented by Council. “The opportunity to have your say doesn’t come around too often, so it’s important to have a broad range of community members contributing to the shape of their local democracy. “If you are interested in the future electoral structure of your local area, I encourage you to get involved. “Public submissions are a vital part of the review process, providing valuable local knowledge and perspectives,” he said. At the last review in 2008, the VEC report recommended the Shire reduce the number of Wards from nine to seven. Council are vying to maintain the status quo, passing a motion at the February 26 Ordinary Meeting to submit to the VEC that it retains the seven single councillor ward structure. The submission continues to summarise that current structure is “consistent with seven distinct geographical communities of interest”, that under a single councillor per ward, it is easy for that person to represent the diverse interests of the wards occupants and that under the current system “responsibility for an issue is less likely to be passed from one councillor to another”. Yet, current submissions from residents do not support this view. Vince Bagusauskas is submitting a multimember structure be introduced into the ward structure and proposes this would lead to members serving for the “greater good of the community” as “all have to consider all views”. Narelle Campbell is submitting a proportional representational model, similar to the Federal Senate. “The Senate model in Nillumbik would provide equal representation of urban and rural residents at council. 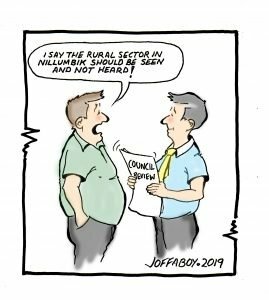 “This would go some way towards ensuring urban residents and landowners, and rural residents and landowners are fairly represented and their needs inform local priorities, decisions and laws”. Local activist and former Greens candidate in the 2018 State election, Ben Ramcharan also supports the concept of proportional representation and is currently campaigning for Nillumbik residents to endorse the idea. “Political views in Nillumbik are deeply divided between pro-environment and pro-development. “With proportional representation, there would be a greater diversity of voices and councillors would need to negotiate, as it would be very difficult for either side to get an absolute majority. “This would result in proposals to council being more acceptable to both sides and less likely to get revoked. “It would also mean less drastic changes at council elections, resulting in greater continuity for the shire,” he said. 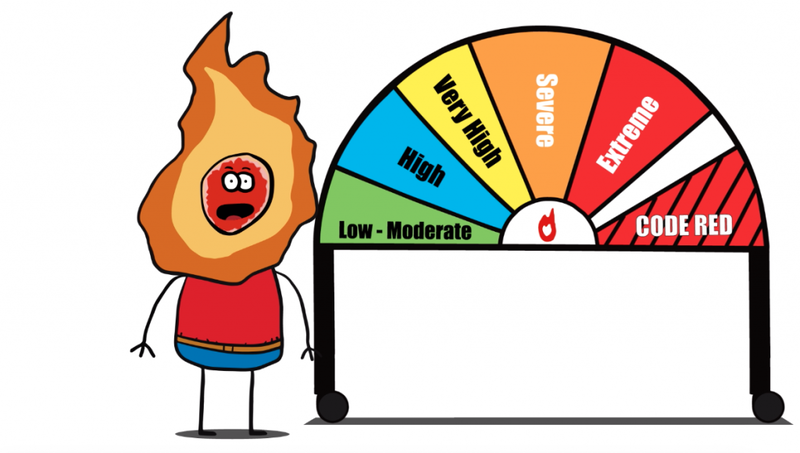 With many shire residents complaining about the town vs country divide and community groups within the Green Wedge fighting with each other and council over ideological differences, the proportional representation model has promise, but is not a golden ticket. Electoral boundaries, both within and without the Shire are driven — under State law — by the concept of maintaining a consistent voter/councillor ratio and with the population spread as it is within Nillumbik, there will always be more councillors in the more densely populated urban areas. But this level of change is not part of the current VEC review, although the review offers a great platform to discuss this issue and maybe even begin working on a governing solution to bring about ideological and geographical balance. 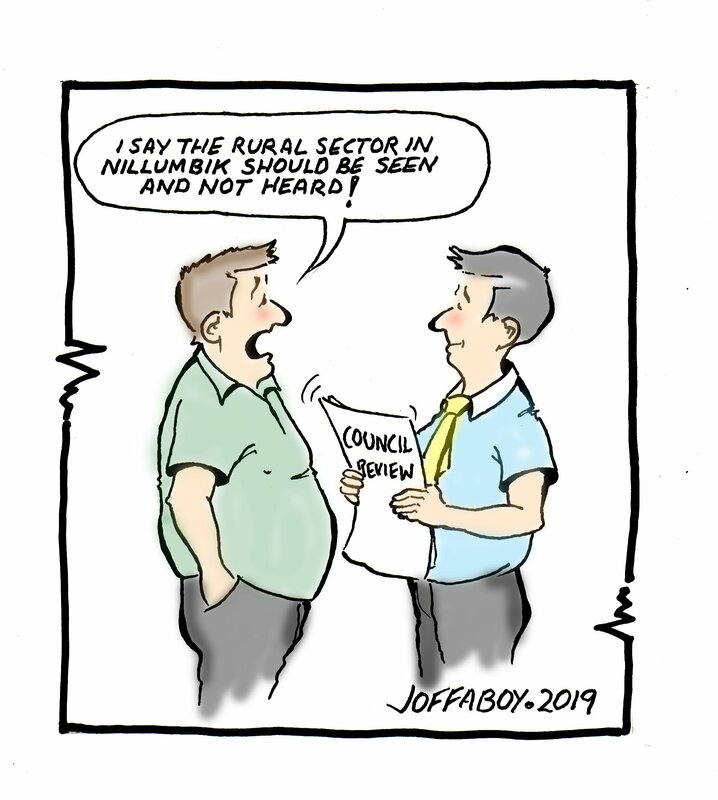 “The biggest solvable issue for rural residents is that half of them are not currently represented by their local councillor because of the political divide in Nillumbik. “Although proportional representation may not solve the problem of rural residents getting less councillors, what it will do is ensure that all rural residents are represented by at least one of their councillors,” said Mr Ramcharan. If you are interested in posting a submission for the preliminary part of this review you can do it online via the VEC website, by email to: nillumbik.review@vec.vic.gov.au or via post to Victorian Electoral Commission Level 11, 530 Collins Street, Melbourne, 3000. All submissions must contain your full name, address and contact number. All submissions will be published on the VEC website or will be available for public inspection at the VEC office in Melbourne. Following the preliminary submissions, a report will be published by the VEC and a window for submitting responses to this report will open. The VEC review of Manningham Council is scheduled to take place before the 2020 Municipal Election but a date has not yet been announced. WITH $400,000 returned to the community this year through grants and sponsorship for a vast array of community projects, Warrandyte Community Bank has now returned a mammoth $3.2million back to the community as it enters its 15th year of operation. The bank’s commitment to “community” is pretty powerful; its goodness showcased every year via its Community Investment Program which sees up to 80 per cent of the Warrandyte Community Bank’s profit being directed straight to groups within the community in which we live. As well as the annual grant and sponsorship program, Community Banks across Australia are committed to funding life saving Automatic External Defibrillators which will be installed in Warrandyte and surrounding suburbs in the coming months. More than 100 guests were hosted at the banks AGM last month for the annual Community Investment Program presentation. Members from local CFA’s, kinders and schools, sporting, environmental, arts, and community support groups, expressed words of real gratitude, reminding everyone in the room Warrandyte Community Bank is certainly “the better big bank!”. 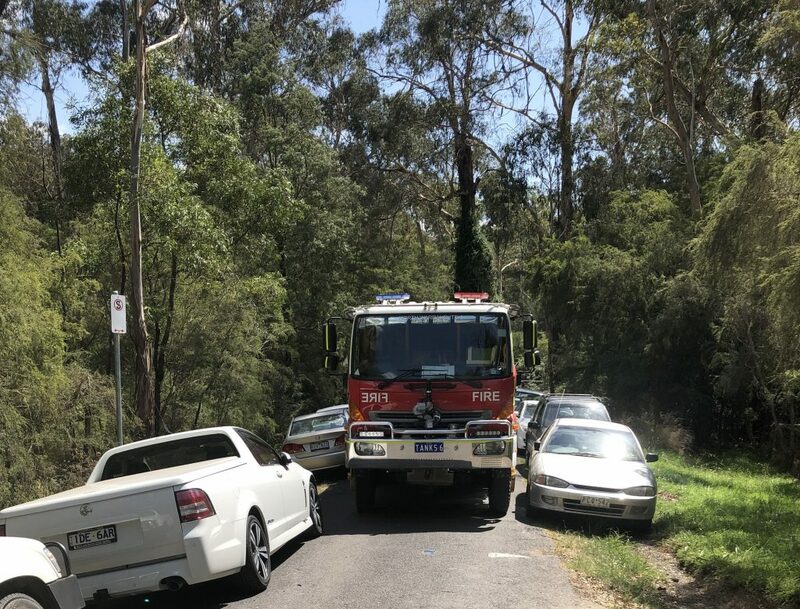 In line with the bank’s yearly commitment of $50,000 to support the Greater Warrandyte Fire Brigades, this year was no exception. 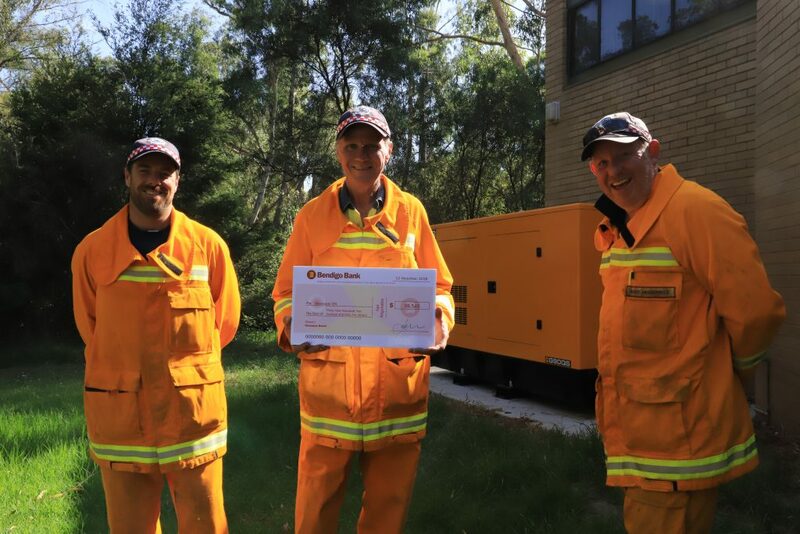 The installation of a Black Start Generator at Warrandyte’s CFA station is considered a vital piece of equipment. In the event of a power outage the station needs to be operational. Currently the doors to the station are required to be opened manually (involving the removal of security pins). They are an occupational health and safety hazard, with potential risk of injury to personnel. Once installed; in the event of a major emergency in the area, the station would be able to be used as a staging area thanks to the Black Start Generator. The objective of the Wizards lighting project is to allow the community to make greater use of facilities all year round. The Wonga Park Reserve is the sporting and recreation hub for the Wonga Park community. Lighting on its top oval will allow users to continue to train and keep active during the winter months and will benefit the wider community, as the reserve will be able to be used for night time events. Project spearhead Annette Felicissimo was thrilled upon hearing the news of the group’s successful application for funding. “We were so honoured to be the recipients of a major grant and this will make an enormous difference to our community. “Attending the evening was truly heart lifting, to hear about the projects in the community focused on inclusion and wellbeing,” she said. Spectrum Journeys aims to equip and empower Carers and Educators as they support children on the autism spectrum, to flourish. This is achieved via a range of programs and projects including autism carer counselling, mentoring groups, dads groups, workshops and SJI’s very special blessing bag project. Spectrum Journeys is passionate about seeing carers supported in their local area. The Warrandyte Outreach programs will help local families with a child on the autism spectrum. Run out of Warrandyte Community Church, services include an Advocacy and Mentoring program which equips carers with skills to advocate effectively and wisely in the kindergarten and primary school environment, as well as connect carers with peers who experience similar life circumstances. Also on offer, will be a Parent Connect program, which works alongside mums who have a child newly diagnosed on the autism apectrum and to navigate mental health challenges, new routines, accessing support and self-care. Part of Outreach will be accessible and heavily subsidized workshops for carers and educators with leading professionals including Hannah Gamble, a Paediatric Occupational Therapist who lives and practices in the Warrandyte area. These workshops are a wonderful way to equip many people with strength based strategies for the home and classroom. Both carer support and education are pillars of this project and are core services at Spectrum Journeys workshops. The Friends of Warrandyte State Park (FOWSP) plant nursery, located at the Warrandyte State Park is dependent on one old cement tank and water from the Yarra River to irrigate 60,000 plants a year, most of which are planted out from Warrandyte State Park to the Kinglake Conservation Link. Water from the Yarra is pumped up to a concrete tank. The 30 year old pump continually requires maintenance and when it breaks down it can take two to three days to repair, leaving the nursery without water. This grant will enable the group to replace its old tank and fit a shade sail over the propagation area, providing a more congenial environment for volunteers all year round. Following the presentations, Chairman Aaron Farr spoke of his pleasure on hearing about, the almost 60 different projects, benefitting members of a very diverse range of community groups. “This year we are returning $400,000 in community contributions, representing 80 per cent of our profit. “Our full suite of banking products are very competitive, imagine what could be achieved if more locals took them up,” he said. Thanks to the support of its shareholders, branch staff, company board and most importantly its customers, the Warrandyte Community Bank Branch of the Bendigo Bank, Australia’s 5th largest bank, has been able to grow to be one of the biggest sources of community funding in the local area. Drop into the branch at 144 Yarra St, to find out more. COMMUNITY GRANTS. COMMUNITY PARTICIPATION. THE BETTER BIG BANK! Warrandyte High School VCE students of Studio Arts and Product Design & Technology put together a refreshing and engaging collection of work which featured in the recent VCE Art Show hosted at the high school’s Doig centre. The talent and attention to detail was impressive as was the diverse range of finished pieces reflecting the creative talents and the focus on Arts and Technology subjects that continue to flourish at Warrandyte High School.